Downtown residents are asking MPs to put accessible docks along the canal near the Glebe and Ottawa East to allow better recreational access. On Wednesday, the Glebe Community Association, and Ottawa East Community Association penned an open letter detailing the request to MPs Mélanie Joly and Catherine McKenna. The letter is asking for a pilot project that would add two temporary floating docks and accessible gates along the canal this summer to increase access. “The reality is people already try and use it for canoeing and kayaking but right now it’s not safe or easy to access,” said Glebe association president Christine McAllister. The suggested locations for the docks were carefully chosen keeping in mind the pathways, safety, and existing boat traffic, according to McAllister. The canal currently offers two points of entry at the north and south end of the downtown – one set of docks just behind the National Arts Centre and another at Dow’s Lake. The only problem for residents in the core is that everything between is blocked off by guardrails – meaning the only way to access the canal is to use a car. The concept is not new. In 1902, the original Rideau Canoe Club was located in the Glebe at the canal and Fifth Avenue. The club moved south to Mooney’s Bay in 1946. Former Old Ottawa East Association president John Dance has been working on the idea for over four years. He said the association recently pitched the project to the National Capital Commission for their 50-year plan. “It’s a little idea with big impact,” said Dance. 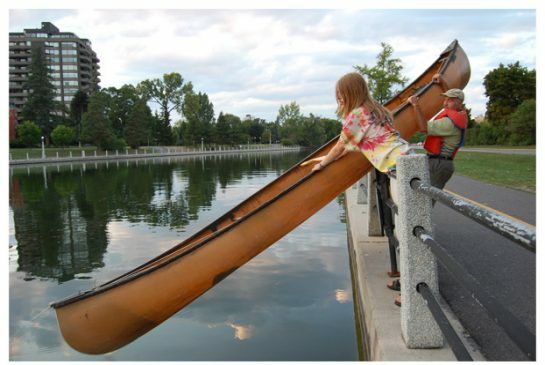 “We’ve so lucky that Ottawa is a very recreational city,” said McAllister. “It’s a beautiful facility in our neighbourhood and this would be a great way to encourage people to use it.